Did that doodling help me learn? Well certainly the doodles were not notes or summaries of the kind we see popularised on Twitter and showing how drawing in class and meetings can help people pay attention–and remember information afterward. Visual note-taking blends these two approaches. By using a combination of words and quick images, the note-taker listens, digests, and captures on paper the essence of what has been heard. My creations were a way to occupy my creative mind while I listened to a teacher talk talk talk. Having said that, I am not implying that all the teaching was boring – rather that the doodling was in keeping with the recent trend to colouring books for adults that have become so incredibly popular. According to this article on HuffPo (and many others! 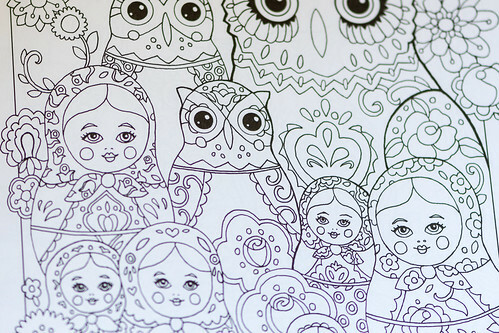 ), as well as being great fun, colouring in is a fantastic way to ease the stress we face in our adult lives. Begs the question if I was stressed by the constraints of my classroom as I did not doodle out of school. The answer to me is pretty obvious – I was, as is also evidenced by the number of classes I skipped. To give the nuns their due, they did not hassle me about classes skipped too much, as my escape was to go and practice piano for hours instead. If I think of our schools and my tertiary online teaching environments – we still have a tendency to ‘old school’ – we still expect students to attend classes! Of course we now understand the importance of creativity in learning. But what do we do today to accommodate our learners? Whether it’s school or tertiary settings, and whether we have flexible classrooms or not, perhaps its time to better discern what the modern stresses really are and to stop hiding behind ‘open plan, multipurpose spaces’ as being the obvious (and only?) solution. What are you really doing to make learning more about engagement than compulsory completion? This entry was posted in Communication Tools, Connectivism, in Australia, Innovation & Creativity and tagged Doodling, Notetaking by Judy O'Connell. Bookmark the permalink.